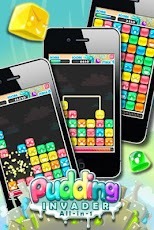 Puzzle games are always addictive it’s in the nature of Puzzle games; mostly matching colors games are always popular. Today we are also reviewing a puzzle game of matching colors, but it is not the traditional matching colors game that you had played in the past. The game has got a story; there was a town where people and their town were peaceful, but a sudden change comes in their town when the pudding attackers arrive in this peaceful town, so now to eliminate the attackers from your town you have to connect a line of two same color puddings with a magic line. Protect your town before it’s too late. 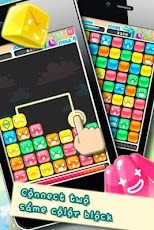 The game is much simpler; you have to connect two blocks of same colors with a magic line by selecting one box and move your finger to the other box of same color and do it quickly because lines will keep appearing. When item scale is full of mana, the item block will appear in the next turn. Click the item block then special expertise will trigger. 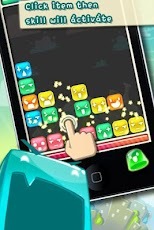 The goal of the game is to clear levels with high scores and get far as possible, without the screen is swamped. Graphics are good; theme and sound are also amusing, must say that game has got so much potential. The game is worthy and addictive its Free must check out game, once you play then you will recognize it’s not like the typical matching colors game which you have played earlier,the game is pleasurable and you will not be able to stop playing for some time.